This nearly symmetrical knot is around three quarters the size of a Windsor knot. Its names half and single Windsor distinguish it from the larger knot that is also known by the names full and double Windsor. When tied perfectly, the medium-sized, versatile knot produces a substantial and deep dimple. It sports a triangular look. It was possibly invented to simplify the Windsor. It was prominent in the 1950’s gray business suits possibly because of the fact that the neat, crisp focal point created by the knot gives it an air of power conducive to business situations. The step by step diagram with easy instructions is beginner friendly. This tying method produces a self-releasing knot. 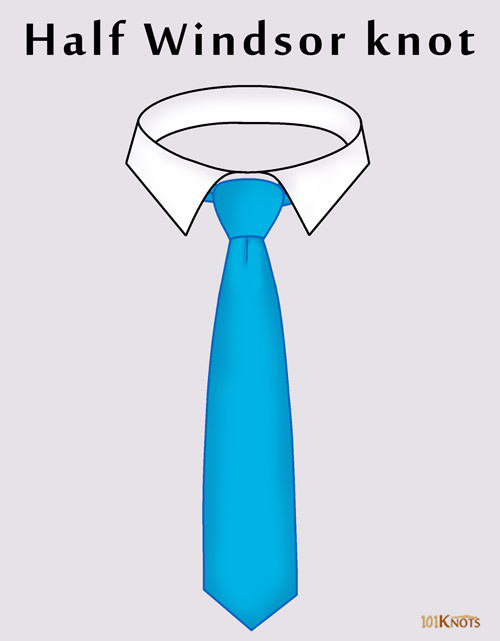 Medium to light thickness of neckties is recommended for this knot. It can be tied with skinny ties. It can be tied on cravats too. Avoid making it on knitted ties as the knot could get too big and chunky. It is a good tie knot option for formal occasions such as job interviews, weddings and business meetings. Manhattan knot – Also known as the reverse half-Windsor, the knot is tied with the seam side up. Nicky knot – Asymmetrical and smaller. Pratt knot – Smaller and more discreet. 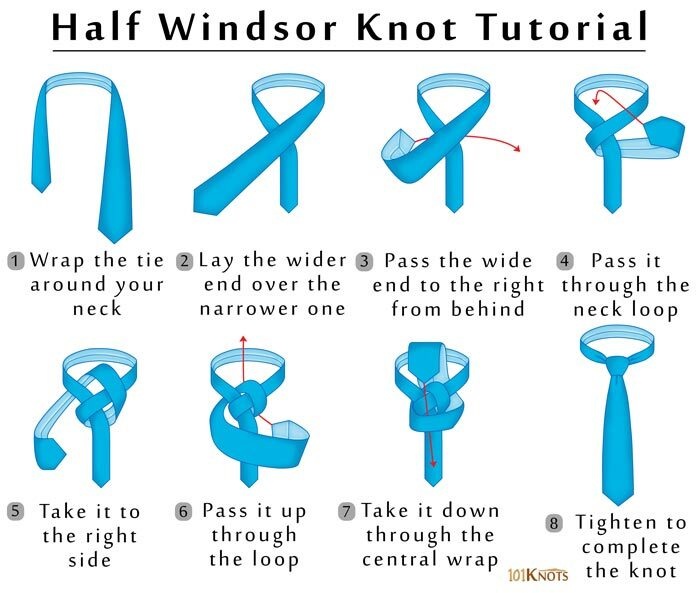 This video gives you a mirror view of tying the Windsor half knot. This video gives you a view of making the knot from above as you would see it while doing it yourself, without looking at the mirror.